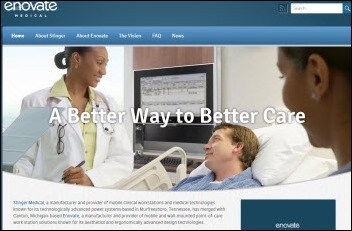 Mobile clinical workstation manufacturer Stinger Medical merges with competitor Enovate, forming the country’s largest mobile workstation provider that will operate under the name Enovate Medical. Stinger’s CEO and CFO will continue those roles with the new company, as will Enovate’s COO. From HIT Veteran: “Re: death of Milton Antonakos. The industry has lost a sales superstar. Milton was always a top performer because you couldn’t outwork him. He was a bundle of energy, had great life balance, and was always encouraging others. Tragic and a reminder to live every day fully.” Milton Antonakos of CareAnywhere, previously with Allscripts/Misys for 23 years, was killed in the crash of an air taxi in Soldotna, AK on Monday along with his wife and three children. Also killed were Chris McManus, MD, a radiologist with Greenville Health System, his wife and two children, and the plane’s pilot. Condolences to family and friends. From QSII Watcher: “Re: Quality Systems, parent of NextGen. Looks like another proxy battle ahead. The Clinton Group, an activist investor, has filed an alternative board slate that includes former President Scott Decker. He’s the second former exec to try to join the board – Pat Cline was added in the last (failed) proxy battle by the second-largest shareholder Ahmed Hussein. Doesn’t look like Hussein is officially part of this proxy battle, but the SEC filing alludes to conversations with him. You can bet he’ll vote his shares in their favor. 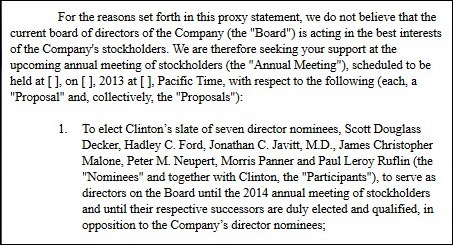 Also on the board slate is Peter Neupert, formerly of Microsoft and now at David Brailer’s Health Evolution Partners.” The proxy statement says the performance of Quality Systems lags its peers in earnings and total return, with share price flat since 2008 while the S&P 500 rose nearly 60 percent. It cites equity analysts in saying that management has no clear strategic plan, keeps chasing distractions, is losing sales, and has questionable potential in the small hospital segment. Above is the five-year share price of QSII (blue), the Nasdaq composite (red), Cerner (green), and Allscripts (brown). 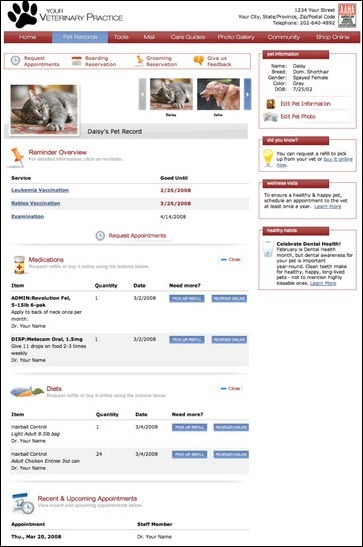 From Ricardo: “Re: pet health portal. Yesterday I received an e-mail from dog’s vet introducing me to their new Pet Health Portal, where I can log in to see my pet’s health record, request appointments, search their pet health library, view vaccination history, etc. I actually laughed out loud considering I’ve received no indication whatsoever of a patient portal offering from my primary care physician. Thought you might appreciate that.” I do indeed appreciate that information, having been equally impressed by similar systems, often rolled out by veterinary chains like Banfield. Vets also offer Pet Mail to answer questions. Next time someone says they’ve been treated like a dog, congratulate them. Notes written by all providers, including non-physicians, are jumbled together and often copied and pasted, interrupting the thought process. The medical record is not data or a repository to hold data, but rather information that has been transformed by caregiver knowledge. From ColonelPeter: “Re: QlikView. 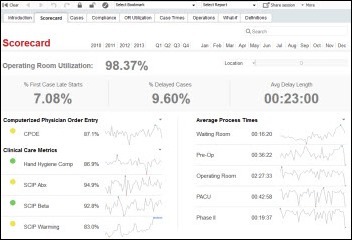 Our organization just chose to purchase a BI technology called QlikView after seeing a demonstration of its integration with Epic at HIMSS. The pre-sales guy was a former Epic veteran who said that they were still working through logistics of a partnership with Epic. Seems if Epic wants to dispel the belief that they’re difficult to work with, they should be trying to fast track a partnership with these guys. We’ve only had the software two weeks and already have gotten a ton of value from just playing with it.” I’ve mentioned QlikView several times and have played around with their free download. You can try their surgery scorecard live demo. The upcoming HIStalk Webinar, “Five Steps to an Enterprising Imaging Strategy,” sponsored by Merge Healthcare, has been rescheduled for Wednesday, July 24 at 3:00 – 3:45 p.m. Eastern. 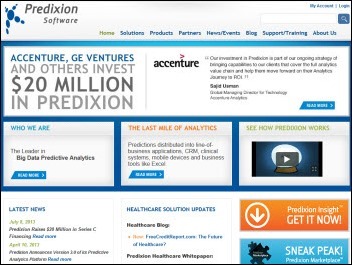 Predixion Software raises $20 million in a Series C financing round led by Accenture and GE Ventures. Coppersmith Capital Management, LLC, which owns 7 percent of the shares of Alere, launches a proxy fight in nominating its own slate of three directors for consideration at the August 7 Alere shareholder meeting. Its letter to shareholders urges the company to sell its Health Management division, which connects diagnostic devices to health management services. The Italian subsidiary of Germany’s CompuGroup Medical will acquire a majority stake in Studiofarma Srl, which sells pharmacy software in Italy and has 7,000 customers. WellStar Health System (GA) selects Besler Consulting to assist with the identification and recovery of Medicare Transfer DRG underpayments. CareBridge Palliative Care Services(OH) will implement Authentidata Holding Corp.’s Electronic House Call and Interactive Voice Response telehealth solutions for remote patient care. Alameda Health System (CA) engages MedAssets for A/R services. The Children’s Care Alliance (PA) will create a health information exchange for underserved children based on HIE technology from Alere Accountable Care Solutions. North Shore-LIJ Health System extends its managed services agreement with Allscripts through 2020. Truven Health Analytics names Roy Martin (WELM Ventures) COO of its hospital, clinician, employer/health plan, and life sciences customer channels. Arcadia Solutions appoints Chuck Garrity (Beacon Partners) RVP. 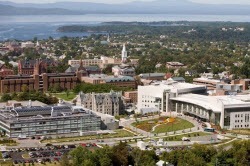 Dartmouth-Hitchcock (NH) names Terry Carroll chief innovation officer. He was previously SVP of transformation and chief information officer at Fairview Health services (MN) and has held CIO roles at Detroit Medical Center (MI) and Baystate Health Systems (MA). Christopher Olivia, who was paid $6 million in his last year as president and CEO of money-losing West Penn Allegheny Health System (PA) before Highmark bought it in 2011, is named president of Continuum Health Alliance, a physician management company whose offerings include IT services. 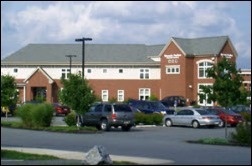 Doctors May-Grant Associates (PA) and Lancaster General Health’s Women’s & Babies Hospital (PA) successfully exchange CCDs between the practice’s Greenway Medical platform and the hospital’s Epic system. 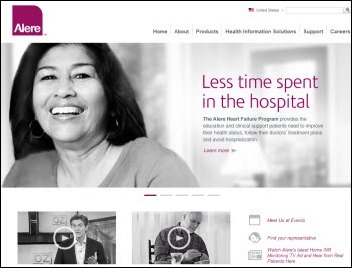 Greenway Medical will add PatientPay’s online patient payment solution to its PrimeSUITE EHR/PM platform. Resolute Anesthesia and Pain Solutions begins a nationwide expansion of Shareable Ink’s Anesthesia Cloud for iPad following an initial deployment at the Boca Raton Outpatient Surgery and Laser Center (FL). 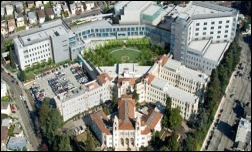 Miami Children’s Hospital implements the AnyPresence solution to enhance development of mobile patient engagement apps. Northern Ireland launches its national patient record system based on Orion Health’s portal and integration technology. 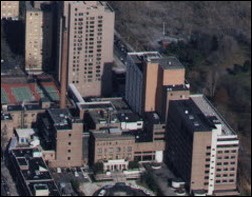 The Brooklyn Hospital Center implements the MedAptus Professional Charge Capture solution for the coding of inpatient and outpatient encounters. HIMSS will announce its HIMSS Health IT Value Suite in a July 16 event streamed live from Washington, DC. It sounds like a pitch for the ROI of products and services offered by its vendor members. 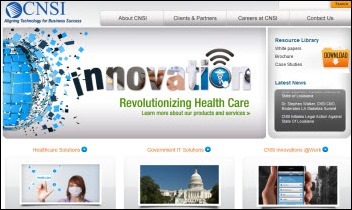 CNSI, whose $200 million Medicaid claims system contract with the State of Louisiana was cancelled over alleged bidding irregularities, claims the state will lose $100 million by keeping its old system instead. A state DHH spokersperson responded, “CNSI really is not in any position to be commenting on costs that may be incurred by the state, especially in light of its own actions.” DHH Secretary Bruce Greenstein, a former CNSI executive, resigned after the probe was announced. In England, the Office of Fair Trading launches an investigation to determine if hospitals become overly dependent on healthcare IV vendors when outsourcing and whether certain vendors try to stifle competition by limiting their interoperability with competitors. Experts suggest that Cerner, McKesson, and Epic will earn lower margins if they don’t open up their systems to third-party products given NHS England’s interest in best-of-breed systems. Gartner ranks Dell as the leading provider of healthcare IT services globally based on 2012 revenues. 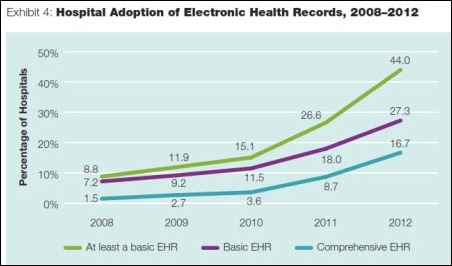 The annual healthcare IT report from Robert Wood Johnson Foundation finds that 44 percent of hospitals had a basic EHR in 2012, up 17 percentage points from 2011, with the number tripling going back to 2010 when HITECH started paying. Only 42 percent of hospitals met Meaningful Use Stage 1, however, with that number expected to drop for Stage 2, and only 27 percent participated in an HIE. The report also concluded that practices weren’t far behind hospitals in adoption percentages, but small practices continue to lag. 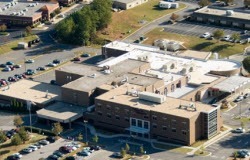 Fitch Ratings upgrades the bonds of Beebe Medical Center (DE) to “stable” despite weaker 2012 operating results partly caused by its write-down of the “not sufficiently robust” McKesson system that was replaced by Cerner at a cost of $37 million. Vermont’s largest employer is now Fletcher Allen Health Care, with 7,100 employees. Weird News Andy says the nurses were right again. The Syracuse newspaper uncovers an HHS report describing a series of errors that almost resulted in St. Joseph’s Hospital Health Center harvesting organs from a patient who was not brain dead. The doctor ignored nurses who argued that the overdose patient was responding to touch and breathing on her own. The patient survived her hospitalization, but committed suicide two years later. Covisint offers a Direct Toolkit that explains how Direct messaging relates to HIEs and why providers should adopt it. Aspen Advisors announces the addition of 19 healthcare clients and 18 employees during the first six months of 2013. Perceptive Software releases Document Filters 11, which allows software companies and services providers to embed their solutions with technology to unlock unstructured files and extract data. Vitera hosts a July 24 Webinar highlighting steps to prepare for ICD-10 success. The Healthcare Network Accreditation Program awards Capario full EHNAC accreditation. Staffing Industry Analysts names Intellect Resources the fastest growing staffing firm in the US for 2013 based on its 125.5 percent growth rate. Twelve CareTech Solutions customers win honors for their hospital websites. Imprivata introduces a suite of proximity and fingerprint readers integrated with Imprivata OneSign to provide an end-to-end identity and access management solution. The SSI Group aligns with ABT Medical to provide release of information services to SSI’s RAC solution. Orion Health moves forward with expansion plans for its Christchurch, NZ development center. Bottomline Technologies will honor Joshua Krantz, an employee who died from injuries received in an assault, at a July 15 memorial service when an award in his name will be announced. The FDA lists iMDsoft’s myAnesthesia app as a Class 1 medical device. TrustHCS launches the TrustHCS Academy to train and place coding professionals in advance of ICD-10. Impact Advisors leads an online CHIME focus group July 16 discussing optimization services. Ingenious Med employees provide financial and onsite support to the Zambia Medical Mission, which provides medical assistance to underprivileged Zambians. I think Robert S. Foote, MD’s piece is interesting in some regards and maybe a bit of hyperbole in others. Bottom line though, the EHR is simply one more tool through which government and administration/CMS/management/payers/employers/quality people are trying to dictate exactly what doctors document. This is an important time in healthcare and we may very well benefit from listening to Roberts comments and asking policy makers to stop and think about what they are requiring through CMS billing / RAC audits, PQRS and other quality management schemes, Meaningful Use and it’s own blizzard of requirements and quality measurements, etc. The physician community might also want to do some self reflecting here. They sit in a unique place with unlimited potential to feed from the wonderful Medicare / Medicaid / Commercial Insurance / sue you into bankruptcy and take your home – feed trough. If you want to feed from that trough at your will, fine, but be ready for people to impose rules, requirements, reporting, measurement and everything else on you. Payment and utilization reform have many elements and implications – including a growing mistrust of the physician community. Some days I feel sorry for doctors. These are the days though when I’m not parking next to the physician parking lot though. Physicians are smart people and should engage in a meaningful dialogue about the core issues here. You can bash EMR vendors, but they are simply the servants to you and your hospital or practice administrators in that they get you paid. And paid handsomely in most situations. If you don’t like junky notes, then don’t write them, and when you see another doctor write one, call them out on it. Just like you did on paper back in the day. Regarding hyperbole – I’ve seen alot of EMR and in particular Epic EMR patient home screens – there aren’t 68 tabs on the home screen of any of them. Agree with the comments about qlikview. I use it now and its made epic data much more actionable and easily manipulated. Its dashboards are excellent for managerial use and really exceed what Epic can provide, at least from what I’ve seen. It’s much easier to launch a pet portal since HIPAA isn’t a factor. Everything about our approach to EMRs seems to be aimed at increasing their complexity. The forces of regulatory requirements, quality improvement goals, and users who simply want to do more all result in a constant increase in the complexity of these systems. Any attempt by the vendor to keep a lid on complexity is met with allegations of being unresponsive to user needs. So, we plod on, adding more alerts, more tabs, more note types. Other software also increases in complexity (remember Windows 3.1?). But we don’t sit down and have “design sessions” for weeks after we purchase a copy of, say, PowerPoint, in order to customize it to “meet our needs.” We just use it, and grumble about what we don’t like, and wait for a next version. We can’t seem to take that attitude with EMRs. So sorry to hear of the passing of Milton Antonakos. What a wonderful guy filled with enthusiasm, energy and love for what he did for a living. He will be missed. How tragic. Colonel Peter and QlikView Supporter do you mind revealing your organizations publicly?